For months, The Texas Tribune has been reporting on why it's so hard to find affordable housing in Texas. We’ve asked lawmakers, advocates, homeowners and more for their take on why affordable housing remains so elusive and what the possible solutions are. Then, we asked Texans for their take. 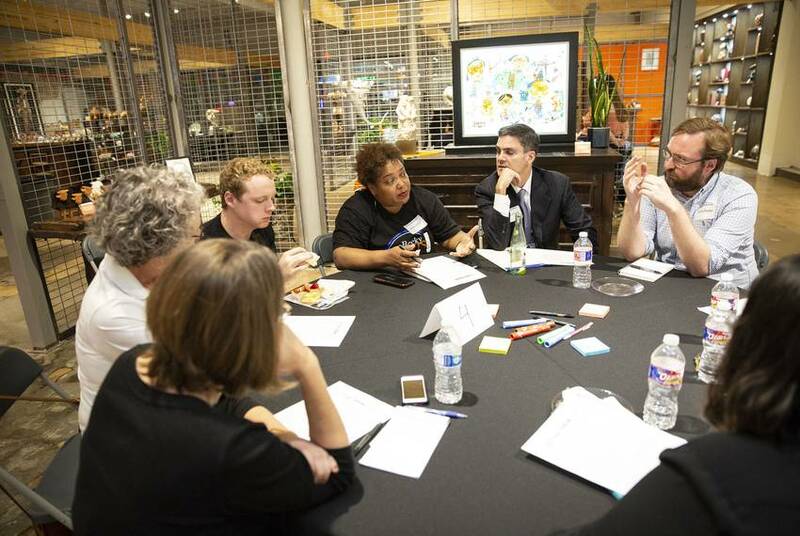 On Monday, the Tribune held roundtable discussions with roughly 40 Texans in Dallas to discuss affordable housing. Here are five things Texans said they want their lawmakers, community leaders, Texas Tribune readers and community members to know about how to address affordability challenges. As we’ve previously reported, many areas that look affordable on paper are actually out of reach for many Texans. Take, for example, three Houston ZIP codes that appear to be home to some of Texas’ most affordable neighborhoods for renters. Turns out they’re only affordable for folks to make much more than the average Texas household income of $54,000. Let homeowners generate profit from their homes. “If you have a house, should you be able to rent to more people or let more people live in your house than the city wants to live there?” asked Melissa Kenfield, one of the roundtable attendees. Most everyone at Monday night’s event agreed that both state and local governments should allow homeowners to generate some sort of profit from their homes — specifically, they should give homeowners the ability to open up their homes to outside guests in the form of short-term rentals. The short-term rental phenomenon became widespread after the rise of platforms like AirBnB and HomeAway — and lawmakers last year quickly looked for ways to regulate the booming industry. In 2017, a Senate bill that would’ve prevented Texas cities from banning short-term rentals and reined in their ability to restrict the practice died in a conference committee. Austin and Fort Worth are among the cities that have enacted such restrictions. Gentrification typically refers to redevelopment that attracts residents with higher incomes and educations in large numbers. It often causes home and rent prices to increase and the physical and cultural attributes of a neighborhood to change. Gentrification is not unique to a single Texas city or ZIP code: Austin, Dallas and Houston have all dealt with gentrification in some shape or form. And one of its downsides? Longtime residents are often displaced from neighborhoods they are no longer able to afford. “While there is disagreement about the potential benefits of rising property values and building upgrades and who receives these benefits, there is broad consensus that displacement is an undesirable side effect,” a September University of Texas at Austin report on residential displacement read. While experts may be in agreement that displacement is one of the more harmful consequences of gentrification, steps to fix and address gentrification and its effects often don’t occur until after an area has been gentrified, attendees at Monday night’s meeting noted. Texans, in response, are asking lawmakers and advocates to flip the script. "Raise the alarm to pull resources in the wake of the threat of gentrification instead of waiting until it’s already happening," Lewis said. A diverse neighborhood is a healthy neighborhood. 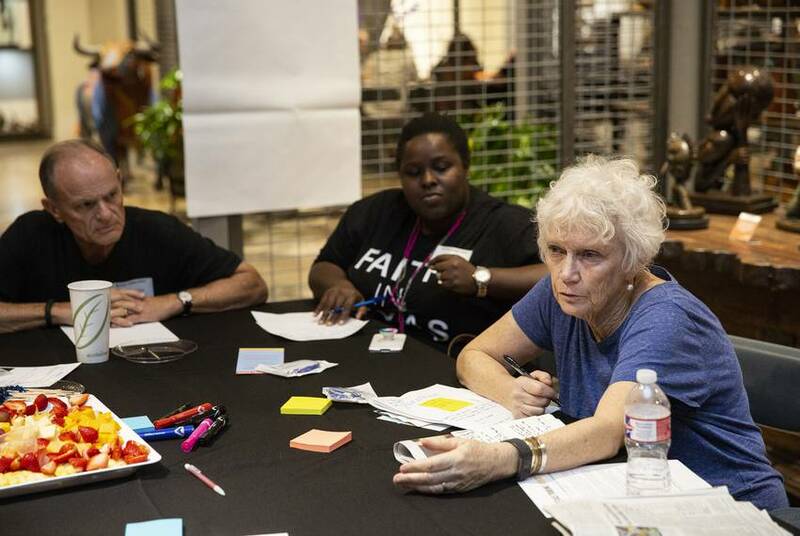 During Monday’s roundtables, one Texan commented that in decades past certain Texas communities had more career and socioeconomic diversity than they do now. Communities that once had racial, economic and career diversity, they said, are now dominated by white collar professionals. Transportation costs – and commute times – count, too. Attendees said housing is just one part of a larger equation. Home prices, transportation, mobility and job opportunities all fall under the affordability umbrella. Kenfield, specifically, said she's heard that some Texans are "stuck in their cars all day because they can't live close enough to where they work." Take, for example, San Antonio's Stone Oak area, which is considered one of the most affordable places for renters in the state. Though rent prices here are considered low, or average, compared to the ZIP code's median household income — the Stone Oak area is on the northern outskirts of the city and a long ways away from downtown. Disclosure: HomeAway and the University of Texas at Austin have been a financial supporter of The Texas Tribune, a nonprofit, nonpartisan news organization that is funded in part by donations from members, foundations and corporate sponsors. Financial supporters play no role in the Tribune's journalism. Find a complete list of them here.